Pantothenic Acid, a B-complex vitamin formally known as Vitamin B-5, is a nutrient that is essential for proper bodily function. Pantothenic Acid is crucial for the breakdown processes of nutrients in food and their conversion into usable energy for cells. 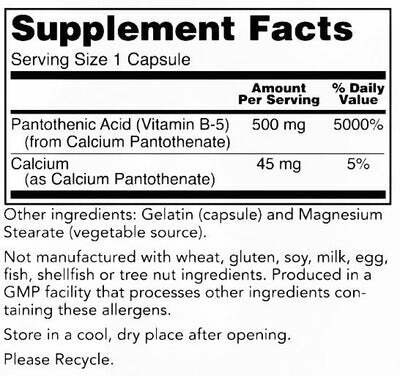 How does Pantothenic Acid support health? Supports the formation of red blood cells and the synthesis of various hormones. Promotes healthy metabolic function and helps decrease fatigue. Contributes to optimal mental function and cognitive acuity. Supports the synthesis of various steroidal hormones and formation of essential neurotransmitters.